The pressure caused by Chiari malformation on the cerebellum, brain stem, and spinal cord can keep them from working correctly. It can also block the movement of cerebrospinal fluid (CSF), the liquid that surrounds the brain and spinal cord and protects them from injury. When CSF doesn’t flow properly, it can build up in the brain and spinal cord and block communication of the brain’s messages to the body and lead to the following symptoms. 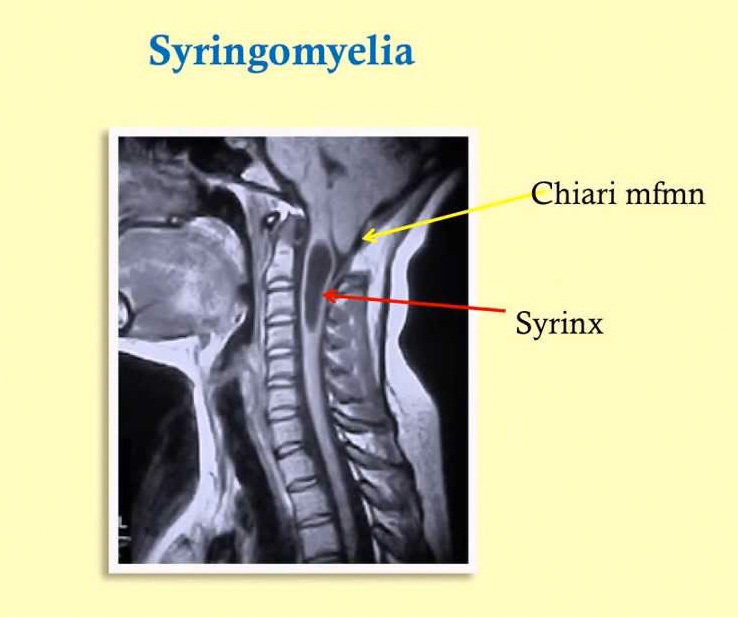 Syringomyelia (sih-ring-go-my-E-lee-uh) is the development of a fluid-filled cyst (syrinx) within your spinal cord. Over time, the cyst may enlarge, damaging your spinal cord and causing pain, weakness and stiffness, among other symptoms. 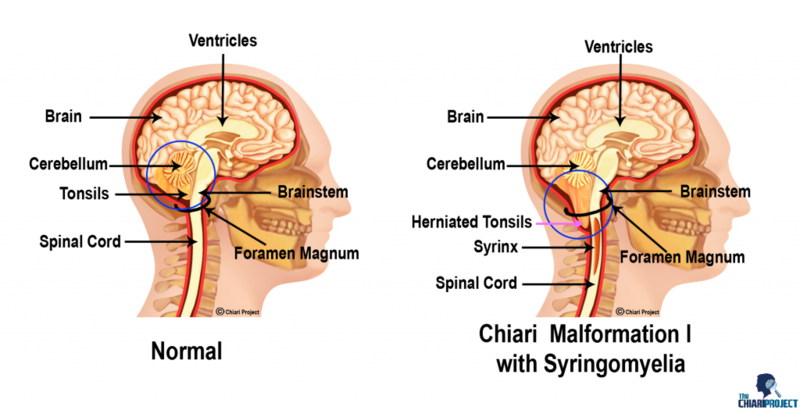 Syringomyelia has several possible causes, though the majority of cases are associated with a condition in which brain tissue protrudes into your spinal canal (Chiari malformation). Other causes of syringomyelia include spinal cord tumors, spinal cord injuries and damage caused by inflammation around your spinal cord. 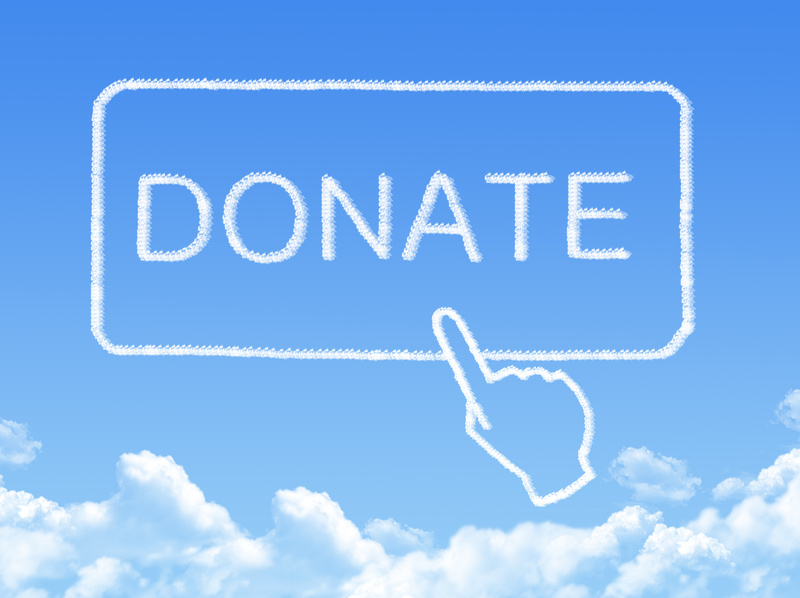 If syringomyelia isn’t causing any problems, monitoring the condition may be all that’s necessary. But if you’re bothered by symptoms, you may need surgery. Chiari malformations can be difficult to diagnose, but a definitive diagnosis is generally made after an MRI scan, where the abnormal protrusion of the cerebellum toward the spinal cord can be seen. In some cases, the diagnosis may be incidental, meaning that a patient who undergoes an MRI scan for another reason may be diagnosed with Chiari when the scan reveals the abnormality – in these cases the patient may not have experienced any symptoms at all.